It may look like Halloween, but the concept behind Mexico’s Días de los Muertos—for all of its skeleton decorations, sugar-covered skulls and cemetery visits—could not be further from our evening of witches and candy overload. Rather this festival, a mix of pre-Columbian and Catholic traditions marked November 1–2 (All Saints and All Souls Days), is a celebration of ancestors, a national memorial day to the dead. And like so many Mexican festivals, it cannot be celebrated without food. 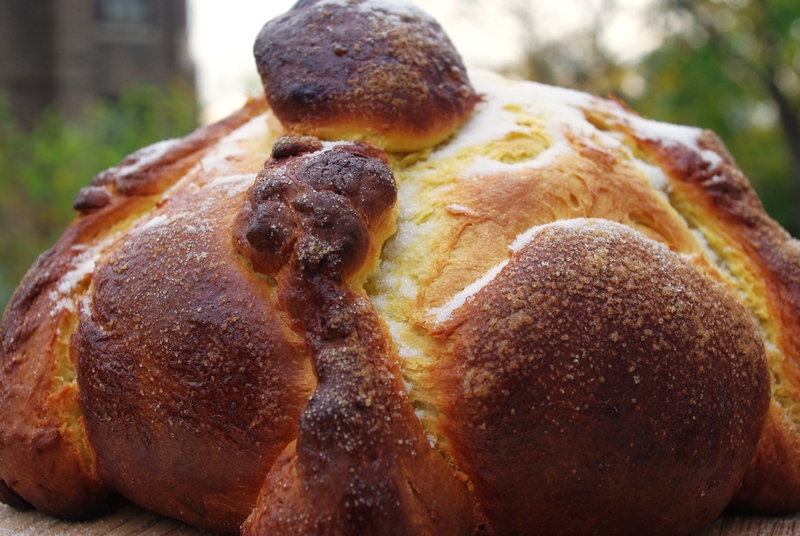 The Day of the Dead inspires fanciful and abundant baking, specifically of pan de muerto, a slightly sweet, decorated yeast bread enriched with butter, milk and eggs. Traditionally baked as a boule, decorated with “bones” and liberally covered with sugar, the bread may also take the shape of skulls or animals. And depending on the baker, it may be orange, cinnamon, nutmeg or anise scented. Think brioche with a sense of whimsy. Some recipes call for a slow-rising sponge or other complicated procedures. I do a simplified version of the bread, building on several recipes and using instant yeast, which requires no proofing or dissolving. The key here is to be prepared with room-temperature ingredients and warm milk so the yeast can grow. The final product is a beautiful yellow loaf with a soft texture and large crumb, perfect for snacking (especially with a steaming cup of Mexican hot chocolate) or as a foundation for French toast—and both a worthy offering to the ancestors as well as a source of comfort to the living (especially straight out of the oven). UPDATE: Here’s a great pictorial from NPR on the Day of the Dead!